Gratitude is a perpetual Thanksgiving. So why does something so useful feel like it requires a national holiday to make us stop and give thanks for all that we have? There are documented physical and spiritual benefits from practicing gratitude on a daily basis, but it’s not something many of us do. 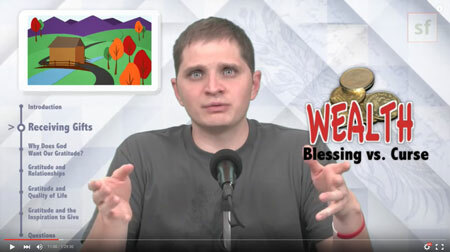 In this episode of Swedenborg and Life, host Curtis Childs reviews some of Swedenborg’s written accounts about how gratitude benefits our relationship with God, ourselves, and others—and offers some practical ways we can use gratitude to enhance our lives and the lives of those we touch. As Curtis explains, this doesn’t mean that everything in life is ideal and pleasant, but it does mean that everything in life has a purpose with the potential for good. A short animation at minute 4:40 explains how the mind, body, and spirit work together to receive and act on gifts from God. It can be hard to see every aspect of life as a gift, especially when we’re experience pain or grief. Even money and wealth can feel like a burden and hardship to some, which Curtis elaborates on at minute 10:23. Curtis likes this concept because it allows us to see that everything we receive (good and bad) is temporarily given to us for the limited time we are here to do what we will with it. It’s up to us to ensure the good (like money) is preserved for good (not greed) and the negative (like sadness) is used for compassion (not frustration). Curtis kicks off this segment with a throwback to an early offTheLeftEye video called “Why Does God Want to Be Worshiped?” The short answer is that God wants our gratitude not because it’s good for God, but because it’s good for us! Gratitude creates humility in us, and humility allows us to have positive, loving, fulfilling encounters and relationships with others. Here’s a can’t-miss clip: At minute 17:35, Curtis introduces a powerful montage of quotes from other religious traditions that all have a consistent message about the power of gratitude for God. From this we can see that gratitude is an essential part of our relationship with God, ourselves, and each other. In addition to historical religious texts and traditions, modern psychology also gives us some important information about the benefits of gratitude. To elaborate, Dr. Soni Werner of Bryn Athyn College explains the phenomenon called “positive psychology” and provides specific examples of psychological benefits of gratitude. So, we’ve established that giving gratitude to God is a good thing for us. Did we mention a grateful relationship with God has a domino effect on our relationships with other people, too? Curtis reads a quote from Dr. Robert Emmons from the Greater Good Science Center, who explains that gratitude is both a social emotion and a relationship-strengthening emotion. Swedenborg says it’s easier to practice gratitude for others when our mutual love is stronger than our self love. Curtis introduces an animated diagram that explains Swedenborg’s philosophy on where our love for others comes from. Even our ability to love is a gift from God that we can be thankful for. Swedenborg further elaborates that we can learn how to practice gratitude and self love from angels. Dr. Werner joins the conversation to explain angelic gratitude and love. Dr. Werner opens this segment by talking about Barbara Frederickson’s research on gratitude and quality of life, and her resulting theory that gratitude leads to broadening and building. 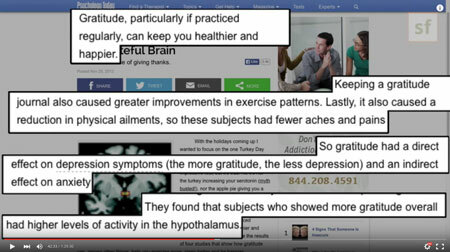 Curtis adds in simple terms that gratitude makes our brains better. Swedenborg was an anatomist and felt that spirits communicate with our internal physical structures, including the brain. 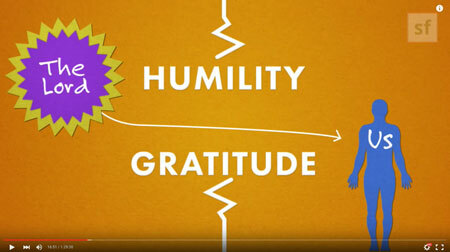 Dr. Werner expounds on gratitude’s mental benefits. Not only are there physical benefits of gratitude, but also spiritual benefits. These benefits are particularly useful when things in our lives are not going well, as Dr. Werner explains. To provide a very personal and emotional account of how gratitude helps in times of need, our special guest Cathy joins the conversation to share how she practices gratitude even after losing two sons. Dr. Werner concludes the segment by describing practical ways we can start practicing gratitude now. Gratitude and altruism are sisters in virtue in that there’s a natural and inherent reciprocal property. You may be so thankful to someone for a kind act that you not only return the favor to them but to many others with a reverberating effect. There’s even a Bible story that reflects this truth: the story of the Good Samaritan, which Curtis explains. 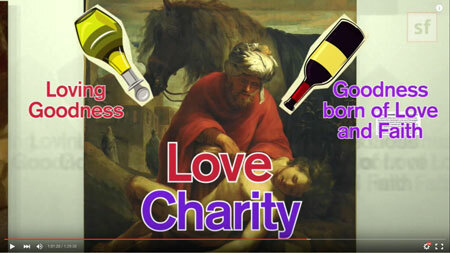 Swedenborg translates the Good Samaritan Bible story with spiritual meaning as portrayed in this animated clip. Jesus preached about this powerful parable to set an example of how he wants us to give to others in need. Dr. Werner ends this segment by discussing the powerful effects of reciprocal gratitude for all humanity.